Sensory regulation affects every one of us. We all engage in sensory processing and regulation on a daily basis. Have you ever felt overwhelmed in a very noisy environment and decided to step outside? Have you ever worn a very itchy sweater and felt extremely uncomfortable and unable to focus during the day? Have you ever felt “fidgety” and found yourself tapping a pen on the table? Those are all examples of sensory regulation. It is the way we process and manage different types of sensory input like auditory, visual, tactile, oral and vestibular (movement). We constantly self-regulate and engage in conscious or subconscious behaviours to help reorganize our sensory processing system. In order to understand your child’s unique sensory profile, it is important to understand the two contiuums of a sensory profile: threshold and behaviour. 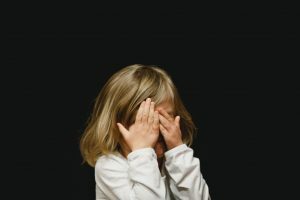 Children diagnosed with Sensory Processing Disorder, or other disorders like ADHD or Autism Spectrum Disorder, have a harder time self-regulating or organizing their sensory systems. This is because their sensory system may be over-reactive or under-reactive to different stimuli that may otherwise be normal to typically- developing children. For example, a child who is over-reactive to auditory stimuli may find the noise levels in their classroom too difficult to manage. As such, they may find it hard to focus, or may even miss something their teacher said. This is because they are being flooded with other auditory stimuli such as chatter of other students, noise in the hall, or even the sound of the heater or AC. Their auditory processing centre in their brain is registering those sounds more intensely than typical, and not filtering them as background noise. Kids who are over-reactive are said to have a low-threshold to that sensory stimuli. This can occur with any other sensory stimuli: visual, tactile, oral or vestibular (movement). A chid may be over-reactive and have a hard time managing most typical stimuli, but they may also be under-reactive. In the case of under-reactive, children may need more stimulation to self-regulate. For example: a child may prefer to sleep or work in an area with constant background noise like white noise. He or she may need a fidget, a weighted lap item or a pressure vest to be able to meet their sensory need for touch and deep pressure. Kids who are under-reactive are said to have a high-threshold to that sensory stimuli. Whether you find that your child’s threshold for sensory stimuli is low or high, you may also find that the way they manage it is different. A children may be show passive or active behavioural response to sensory regulation. For example, if they have a low threshold and show active behavioural response to auditory stimuli, you may notice that they cover their ears often, and sit in the back corner of a noisy classroom. If they are passive in their response, they may seem highly uncomfortable and distracted. This brings us to the four sensory profile quadrants (Dunn, W. 1999): on one side is the threshold continuum (low to high), and on the other side is the behavioural response continuum (passive to active). Notice that both the threshold levels and the response fall on a continuum. The severity of the threshold and behavioural response is different for each child. You may also find that your sensory child manages different sensory stimuli differently. For example, they may be very sensitive to light, but may have a very high threshold for vestibular input (movement). Sensory regulation is essential in order to function in any environment. Kids who have difficulty with sensory regulation may find it difficult to engage with their peers, complete tasks independently, or focus during lessons. Sensory Processing Disorder may significantly affect a child’s ability to participate fully in everyday life. 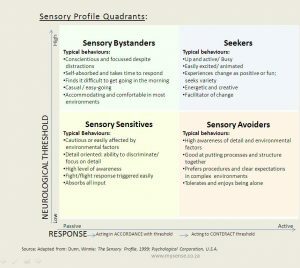 Understanding where your child falls in the four sensory quadrants is the basis for establishing self-regulation techniques and developing a sensory diet. Occupational Therapists use various types of assessments to help understand a child’s sensory needs. Do you need help understanding your child’s sensory needs? Send me an email and I’d be happy to help.